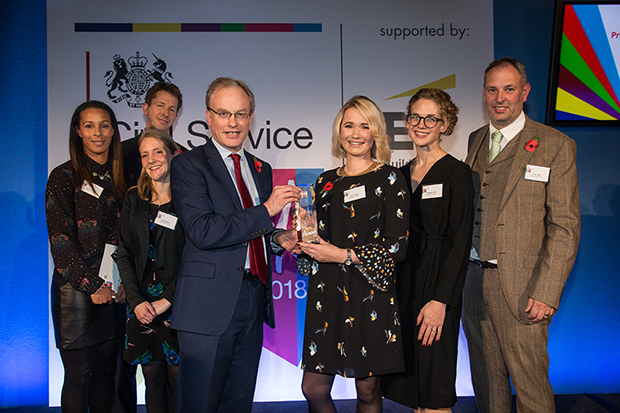 The entire Ministry of Justice team, from HR to MoJ Digital to analytical services, as well as communications colleagues, were delighted with the award. One of the most important aspects of winning an award is that it sets up expectations that the team will continue to excel. We continue to identify ways to improve aspects of the prison officer recruitment process and recruitment performance indicators, including the overall time-to-hire, and to test new and innovative technologies. These include ‘gamification’, an automated sifting tool, which we applied in January 2019 on our high-volume campaigns. Work also continues to increase the diversity of new recruits to support HM Prison & Probation Service’s commitment to ensure the workforce is reflective of the working population and that we attract the right people with the right skills. Focus also remains on supporting retention through the offer of a prison officer apprenticeship and the implementation of the new Civil Service Success Profiles [as covered in issue 17 of CSQ]. Coupled with the implementation of a new web-based self-selection tool, which allows candidates to get a better understanding of the role, our Success Profile has helped us to better understand what the prison officer of the future looks like. 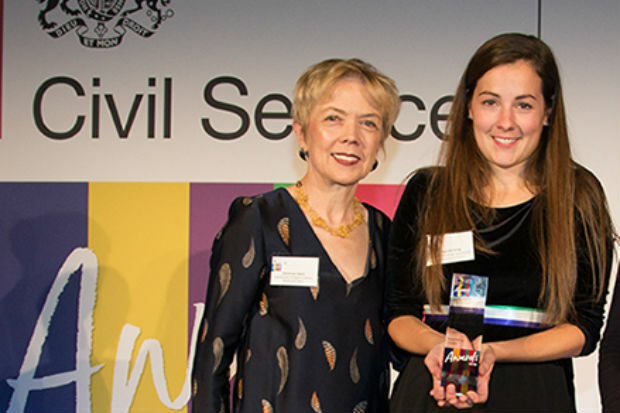 This award demonstrates what can be achieved when you have a multi-disciplinary team of ‘brilliant’ civil servants who used collaboration and open, honest communication achieve a common purpose – while embodying the Ministry of Justice’s value of ‘Together’. 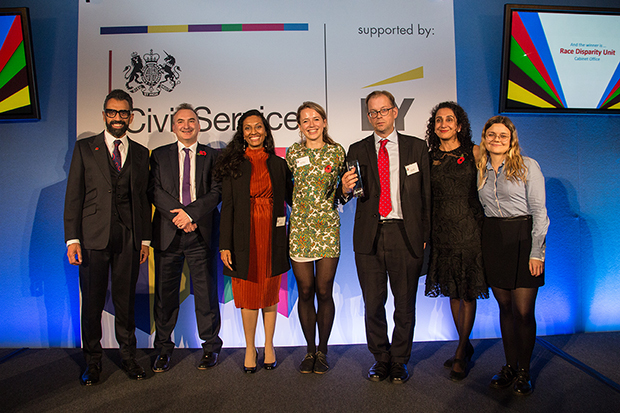 We were absolutely delighted that our team in the Race Disparity Unit (RDU) was awarded the 2018 Civil Service Chris Martin Policy Award. The RDU was announced by the Prime Minister in 2016. The aim is to challenge ethnic disparities – differences of treatment or outcome affecting people of different ethnic backgrounds – by shining a light on them with government data. In government terms, the Race Disparity Audit was a genuine start-up – there were no people, structures, precedents, offices (or money) when we started! We were literally handed a six-page policy paper and asked to make it happen. The RDU is a fantastic multi-disciplinary team, bringing together people from data, digital and policy backgrounds to build something new. We all learn from each other and have gained valuable skills across these three expert areas – and we challenge each other a fair bit too! So, although the award was for policy, it was really an award for our whole team. The work continues! Ethnicity Facts and Figures is a permanent live website, which changes as the data changes in the real world. In addition to adding new data, we have significantly improved the website’s digital capability and have worked with departments to deliver strong policies across a range of topics, including education and employment. Our team loves new challenges, and we have ambitious plans for the year ahead. Our forward priorities include working with departments to achieve greater policy change and impact in the real world, improving the experience for users of the website, and harmonising how government classifies ethnicity. There’s even a spin-off strand, #3OD, to share our learning on improving access to open data and encourage open dialogue for open democracy. We have had tremendous help from many people across government and beyond. You know who you are and we look forward to working with you in the next phase! I remember the moment I found out I had made it into the Civil Service. I was sitting in the car with my mum and sister when I decided, for the 20th time that day, to check my Fast Stream account for any updates. When I saw the message saying I’d passed the assessment centre I didn’t dare believe it was real. I tentatively shared the news with my mum, saying I needed to check, double check, maybe even triple check for sure. Fast-forward six years and I did a similar reality check as I stepped on stage to collect the 2018 Civil Service Diversity and Inclusion Award – I had a quick pause and looked up at the screen to make sure it was definitely my name up there and that I hadn’t got a little carried away! There are many achievements over these past six years that I’m proud of, but definitely up there is work with other brilliant civil servants to champion social mobility and get it firmly on the agenda. When I first joined the Civil Service, I felt I didn’t fit in because of my background. Six years on and I couldn’t feel more different. Through championing social mobility across the Civil Service, and talking about why it’s important, I have met so many great people, including those I worked with to establish the Cross-Government Social Mobility Network. Through this network we created a space for people to share their experiences, increased understanding of what social mobility is and why it matters, and supported around 10 departmental networks to grow in the first year alone. Today there are nearer 30 networks across the Civil Service and its agencies. On a personal level, speaking at events such as International Women’s Day and Senior Civil Service basecamp really boosted my confidence. I now have no doubt that I fit in, and that, really, I probably always did. I am very much indebted to the person who nominated me for the Civil Service Award, the judging panels and, most importantly, those I worked with along the way to achieve all we did together. 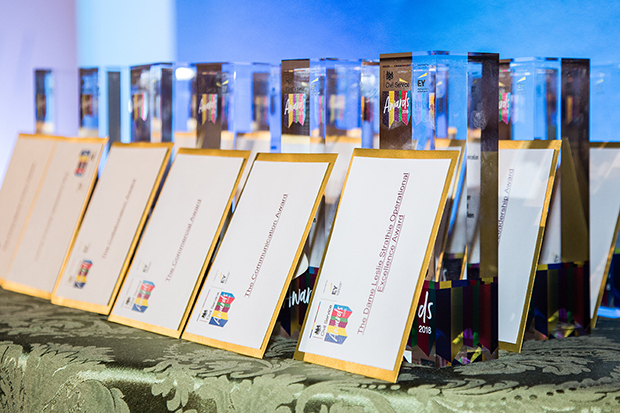 Winning the award has only strengthened my determination to do more, and I have since spent time talking with people looking to set up new social mobility networks both inside and outside the Civil Service. Sharing experiences and learning is so important, and this award has shone a spotlight on social mobility and why it matters. That, for me, is the greatest part of it all.